A blog about food, travel , lifestyle and everything in between ! The pace of time never changes , second by second day month and year go by and yet at the end of every year one feels that this one just breezed by. Some years are just change in calendar, our lives , people and surrounding pretty much the same while other makes a huge change in your life . It defines you who you are and who will be for rest of your life...... 2015 was such epic year for me ! I am thankful more than ever to all people in my life who helped and are helping me in this journey, my family ,friends and doctors I could not have not anything without these people in my life. I have so much to look forward this year, watching them grow, ensuring that both of them are happy and healthy, spend as much time as possible with them. I want to be in better health, a better cook and overall a better person to be the best possible mom. Let me start by stating the obvious – the story about a successful middle aged man falling for a younger beautiful woman ( and no I am not giving the plot away , its stated on the cover) is quiet a cliché . So what works for this novel ? The characterization is real , we all know these Aditya , Maya , Sherya , and Sanjay in real lives . All of us have come across such characters in real life , a highly successful, the devoted wife , the ambitious next gen and a best friend. Characters are clearly sketched and helps you visualize the narration very well. The world of contemporary Indian literature, where every book is a ‘product’ that needs to be marketed. From the right celebrity endorsement to encouragement on social media, this book gives you a good insight into how a book is really ‘made’. There are references to real places , persons and events , helps create a mood for the book. There are some no so subtle pot shots on his contemporary Indian writers – dance reality show judge, !! The banking background , we all know the writer background in banking and he has leveraged his knowledge beautifully in previous novels, however for this book it seemed forced . The drama around layoffs due to financial pressure occupies much of novel space but doesn’t really serve any purpose. The characters and the plot could have in any setting and it would have worked. The ending , too Bollywoodish for my liking, everything works out nicely , Adiyta manages to rise above everything because the other party was scheming and plotting against him. Given the book is going to be made into a movie I am not really surprised at the happy ending , but not the way it’s been portrayed . I am reviewing â€˜The Bestseller She Wroteâ€™ by Ravi Subramanian as a part of the biggest Book Review Program for Indian Bloggers. Participate now to get free books! "Travel is more than seeing the world; it’s seeing the world in a new way." I have had some amazing experience travelling. Some expected , some unexpected . Korea was one such unexpected experience and a total pleasent one to that. I simply loved the experience . Right from food to shopping everything was superlative. Shopping especially was mind blowing , I am not much of a shopaholic but there was something in the air that even I couldn't resist. 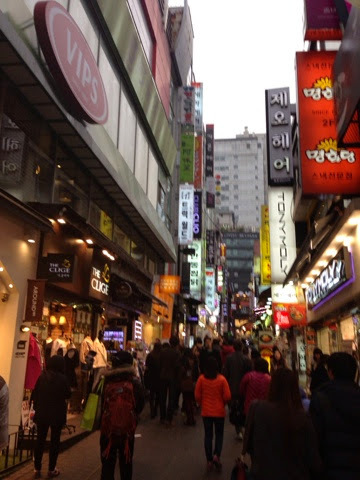 We stayed in Lotte Hotel in myendong area which a Mecca for beauty shopping. I had no idea about korean beauty industry before landing in Seoul. Infact in general i was not much into beauty and or skincare , my skincare routine till date was face wash and apply simple cream in morning, and the days I felt extra greasy I washed my face at night . 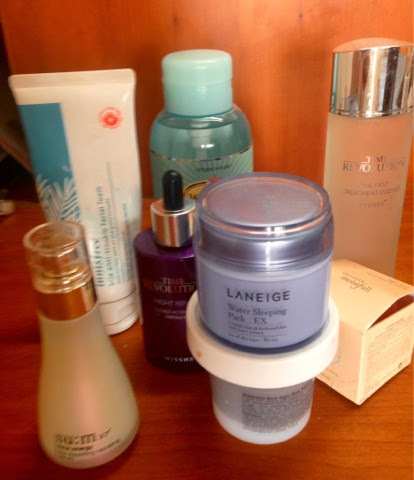 But landing in seoul opened my eyes to a different world, a world of hi tech beauty care. A world so complex and fascinating , a world of mind boggling 10 + beauty care steps !! It was just everywhere and when i realized every single person in seoul had amazing beautiful soft skin i fell for it too. While I still have not got into that kind of elaborate routine , but have definitely expanded myself beyond clean and cream routine . My medicine cabinet looks something like this today. I clean , tone , moisturise and apply eye cream on daily basis and on a good day either scrub or apply a water pack. Back in the groove - tips on better holiday ! 1 . Clean your house before you leave or at least make your bed : My packing is always last minute, I am always rushing to find the hat I picked in the last trip or the lovely silk scarf which will go fabulously with all dresses , end result house it topsy turvy and I just have time to lock the door and run. This also means that when I return and I am so tired and one look at the mess and all I want to do is to run away. So the tip this time was to clean up at least the living area before I left and also since we were reaching back late in night , I made the bed. Once back, the house look good enough for at least not to make me call housekeeping and run away J I peeled over the bed covers and slept my jet lag away. 2. Account a ‘break in’ day : So typically our holiday ends on Sunday and we have to be back in office by Monday. This time we actually returned on Saturday that gave us a day to unpack , chill , load up on grocery water the plants and gently get back into the groove, by evening we were feeling so good and relaxed that we actually caught a movie and slept early . Monday was not too terrible for once. 3. Arrange for food : You know what time you would be arriving home so arrange for breakfast / lunch / dinner accordingly. After all these days of eating out , home food is what one really craves for and ofcorse kitchen is not the first place you want to be in. Personally , we are lucky to have a place our area that delivers homemade food . In case you don’t have any such place ask your friends and family nearby. My mum and Aunt live within couple of kms and they have a wonderful arrangement going on , whenever any of them travels the other ensures that hot food is delivered at her place on arrival day. You can have a similar arrangement , in case your friends don’t travel much you might want to ‘repay’ the favour by babysitting for them or taking them out for a nice meal or better still inviting them for dinner while you prepare the new exotic recipe you learnt on your trip. Win - Win for all. 4. Unpack right away : A huge point of contention with my husband always. Whenever he is back from a trip (and he travels a lot – 20 days a month ! ), he simply unpacks right away, putting clothes in washing machine and such, and I always hated it. Gradually I have realized that this is probably the right way. I may not do the laundry right away but I do put away clothes batches to be cleaned later and clean up the suitcases to be stored away. This also ensures that if I bought perishables (And I always buy local food), they are stored properly and not found stinking after couple of days. I followed all these tips after a 2 week break this time and somehow the ordeal of getting back to daily routine was not that painful. Try it this time when you are heading to your spring / summer break and you just might be as glad as I am. P.S. looking for a perfect scarf , i really like this one . After the rather chilling but very exciting experience of day 1 in Ulaanbaatar, next day we planned to take a trip down to Terelj national park , about 60-70 kms away from the city center . Its a national park which is largely un developed and is best to view and understand the landscape of Mongolia away from hustle bustle of capital city . The travel to national park is pictresque with miles and miles of imposing mountains and hardly any settlement . While in summer the there are plenty of activity at the park like Rafting horse riding, hiking and you can even stay in the famous Ger tents , with snow all around for us it was more of the journey than the actual destination. You can attempt skiing in winter but we are yet to learn to ski so there was nothing much 'to do'. We had a rather nice lunch at Terelj international resort and spa hotel . 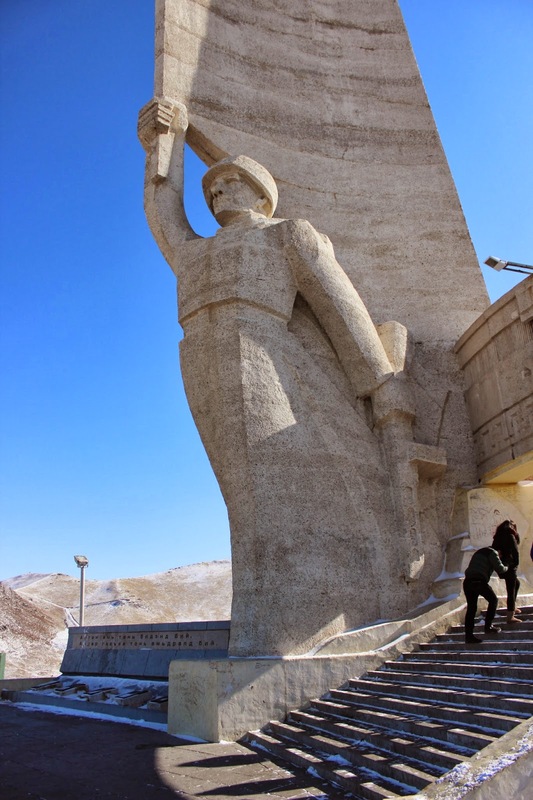 On the way to national park , there is a mini stopover at Genghis khan statue complex , an imposing structure over 40 meter tall set against the barren hilly landscape. The complex is still work in progress and there is a small museum in the complex. While the museum's collection is not very grand its interesting nonetheless. Do check out the small video playing in a corner room which describes how this structure was made and put together. We had hired a cab from our hotel Kempinski Hotel Khan palace and it was great choice , the driver was knowledgeable and car very very comfortable. And the best part of the trip, we got to see dianosaurs !! It all started with a business trip and like per almost always husband's business trip. He gets to travel to some really exotic parts of the world due to his job and although he is not good with exotic or even anything remote, preferring to travel cities and beaches , somehow he thought this was different enough for a return trip and that I must visit it. 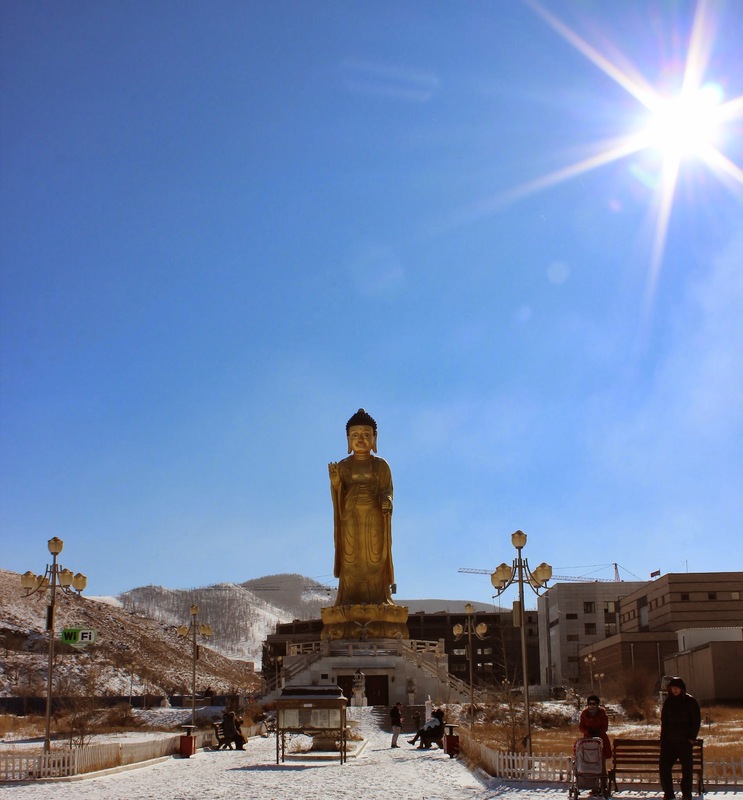 Well this exotic place is Ulaanbatar . Don't fret if you have not heard of the place before most of us had not. 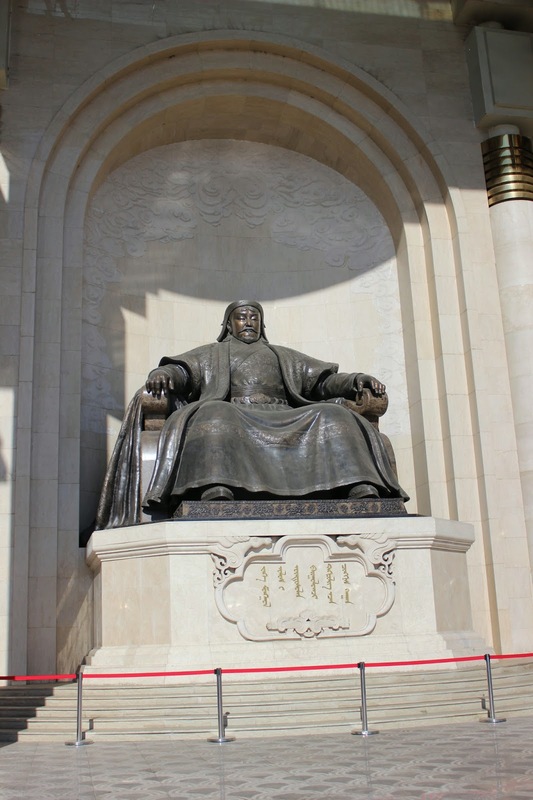 It's capital of Mongolia. A country landlocked between Russia & China . While i was little tempted with the pictures i saw of him there i was very much skeptical, i mean if i am spending time and money in going somewhere why don't we go to switzerland or even eastern europe, surely prettier and more 'known' , but for once husband was in mood of trying the off beaten path and i was curious enough so i said yes. We flew Dragon air (Code share Cathay pacific ) from Bangalore to Hongkong (, after a brief stop over of couple of hours next flight from HK to Ulaanbaatar , we reached in evening after 6 pm. I was wearing layers and layers of cloth but the moment i stepped out of airport a chill blast hit me really hard. Now i have lived in Chicago and london during cold weather but this is something else. I froze in that 2 minutes walk to cab. On way to Hotel , although it was almost dark outside from whatever i saw it felt little bizzare , like i have landed into Narnia type of place. It was surely not real, unfortunately the traffic jam at the next red light made it all too real and since it got really dark outside and the cacophony of traffic made me lose interest in whatever was outside , i was happily smug in heated comfort of car. We were to spend 3 days in the city , so on day one we decided to do a city tour of sorts . 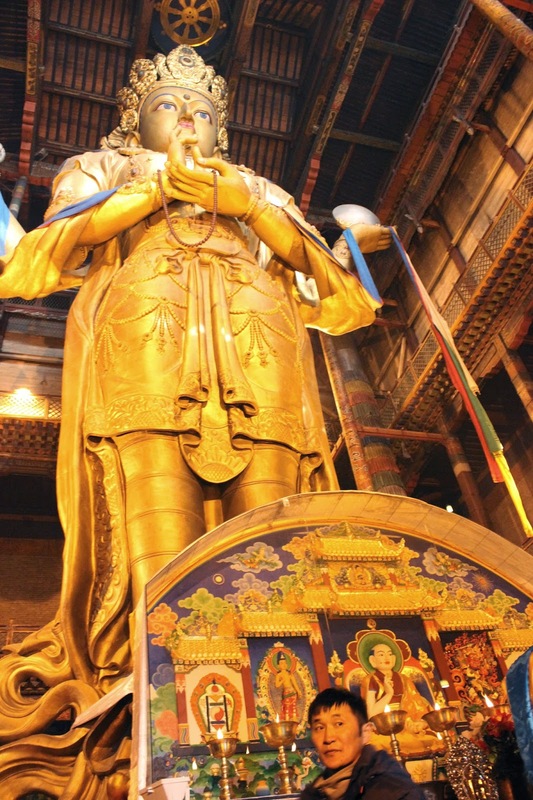 There are not too many things in the city to really visit but some places worth visiting Sukhbaatar palace , Winter Palace, Zaisan memorial and Choijin Lama Temple Museum. There is also a national museum but we decided to skip that so really cant comment on how good it is. 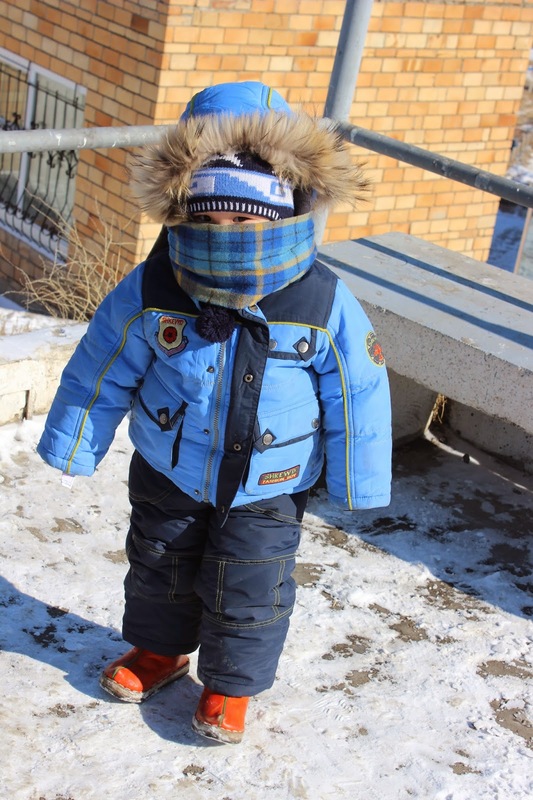 But the first stop we made was at State Department store (must visit in Ulaanbaatar for all your shopping need) , after having foretified ourselves with suitable gloves and caps socks we stepped out to tour the city. Like most of the developing asian country Ulaanbaatar or UB as it is better known is in middle of crazy growth and that means high end stores (LV has a huge building next to main sqaure), big cars and crazy crazy traffic ! Although its a small city do account for snail pace traffic time to account for travel time. Summer delights - Lemonade made easy !